… all at the same time using a Jonsson shrimp peeling system. or any other method. So, whether you spend just a few hours a day peeling shrimp or you peel thousands of pounds an hour, we have a system perfect for you. The key to top quality is individual shrimp processing. Jonsson machines automatically adjust to each shrimp, gently peeling and deveining it in the style selected. Shrimp are placed in a plastic tray. The rest is automatic. Briefly, here is how the peeling process works. Since the machine adjusts to every individual shrimp, size differences are not a factor. 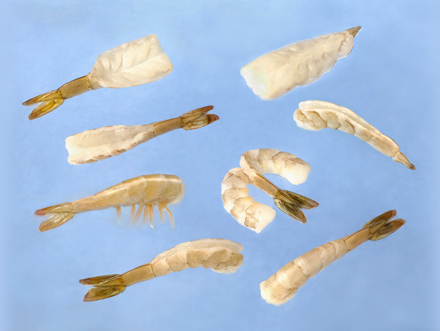 Peel raw headless shrimp from as large as 10 count (10 shrimp per pound) to as small as 71/90 count. Peel any kind — all warm water shrimp, wild or pond raised, fresh or thawed. Now enjoy a higher yield of better looking shrimp, with higher quality and a more profitable product with a Jonsson system.